The Indiana State Department of Agriculture recently promoted Ross Newton to deputy director and hired Amanda Williams as field auditor, both within the Indiana Grain Buyers and Warehouse Licensing Agency. Newton grew up on a beef cattle farm, and was the Indiana FFA reporter from 2011–2012, as well as a 10-year 4-H member. 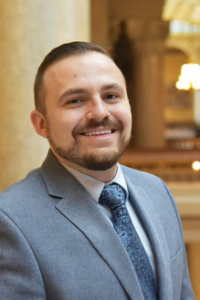 In 2016, he graduated from Western Illinois University with a bachelor’s degree in agriculture and was hired shortly after by the state as a field auditor. 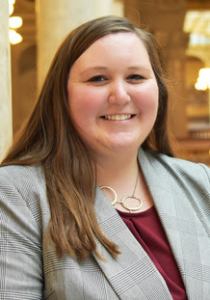 As the division’s deputy director, Newton will support the director by overseeing the licensing and licensing renewals of Indiana grain facilities, as well as portions of the auditing process. He will also help manage the moisture meter program, which ensures the accuracy of each grain facility’s moisture testing equipment. Williams graduated from Purdue University in 2015 with a bachelor’s degree in agribusiness management. Before joining the state, she served as a superintendent for the Gavilon grain facility in Rushville, where she supervised employees and was head of elevator operations. Williams’ role as field auditor includes auditing the licensed grain facilities in central Indiana and testing their moisture meters and ensuring compliance with state regulations pertaining to the marketing and storage of producer grain. The Indiana State Department of Agriculture was established as a separate state agency in 2005. The agency reports to Lt. Gov. Suzanne Crouch, who also serves as Indiana’s secretary of agriculture and rural development.